For day 21 of the National Hot Dog Month Tour, all I had to do was step outside. Saturday July 21 had me grilling Pearl All Beef Franks on the grill for a summer cookout with family and friends. We do this party every year around this time and it's a lot of fun. Beach, boating, water slides and hot dogs! Drew Bennett won't be taking any pictures for the Hot Dog Stories Facebook page- he's working this weekend. 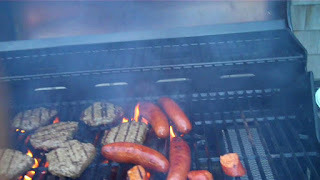 Get the full story on our summer cookout on Hot Dog Stories.